Regardless of the time of the year, there is always one thing that the seasons have in common, there are always large events. At these large events are large crowds of people who will most likely need to use the restroom after enjoying food and drink. 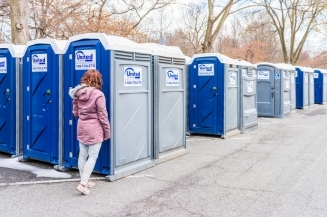 Rather than create a long line at the venue’s provided restrooms, it may be a better solution to acquire a porta potty rental in advance to reduce the risk of people waiting a long time to relieve themselves. Here are some of our top three winter events where it is a good idea to consider using portable restrooms as a quick, affordable, and clean way for your event attendees to be able to use the restroom and happily carry on with the event. Although these events are usually held in Texas malls, there are some instances where ice skating rinks are created outdoors. When you are out on the ice, enjoying the skating and realize that you have to make a restroom break, you don’t want to have to wait to get to the nearest indoor facility. That is where a porta potty can come in to save the day. With portable restrooms rentals on-hand at an affordable price, your guests can still get to the restroom and have ample time to enjoy the ice without any major interference. We all know that family gatherings can get crowded and the restrooms can be on a constant lockdown. For this reason alone, it makes sense to order a couple of porta potties for your next family gathering, just to be safe. New Year’s Eve parties are also a good event for porta potties. With all of the champagne flowing, there is bound to be a lot of people needing to use a clean restroom. This same mentality also comes in handy during office Christmas parties where a convenient and clean restroom is always welcome. It is popular in large cities like Fort Worth to hold holiday concerts in the park. These can be orchestras playing classic holiday tunes or can be full-blown concert events from visiting artists. Either way, park restrooms aren’t always the cleanest places to go. For your event which is bound to be a pristine and classy one, we suggest ordering a portable restroom trailer that holds multiple people in stalls and has all of the cleaning amenities that one would need to feel fresh for the rest of the occasion. If you are planning on hosting an office holiday party or a large New Year’s Eve party and need some portable toilets for your event, get in touch with Got To Go Solutions today. We have an assortment of different restroom styles from the standard porta potty to the more quality trailer style restroom. Regardless of the style or size of your event, Got To Go Solutions has got you covered. Give us a call to find out more about our available portable toilets in your area.